Many readers know that I've moved to the Bay Area. Here's my account of last night's earthquake, the Bay Area's largest since the 1989 Loma Prieta earthquake. I’d been having a lousy, restless night of sleep. I’d taken a Benadryl so I was in a fog, but it obviously hadn’t knocked me out enough so that I was sleeping soundly. At the fateful moment, I’d been concluding a short visit to the bathroom. As I finished up I heard a series of popping noises. The suddenness and general sound vaguely reminded me of a summer storm where hail commences abruptly, creating popping noises on all that it contacts. But knowing that such monster hail wouldn’t be possible here, my mind raced for other explanations. Could it be kids in the neighborhood up to pranks in the middle of the night? Soon, I was pretty certain the sound was from the cords from blinds striking either the blinds or windows. This seemed a reasonable explanation because it’s often windy here and we frequently have the windows open to let the ocean-cooled air rush in. But then I realized there was absolutely no wind and the night was otherwise calm. The fast-developing mystery was moving into high gear. “What the hell is that?” I blurted to Rachel, whom I expected would still be sound asleep. By then, of course, it was essentially over. And my immediate response – yea I’m a sicko – was anger that I didn’t fully experience this other worldly event. Rachel theorized that the lightheadedness I felt, which I blamed on sleep deprivation and the woozy effects produced by Benadryl, was because I was standing while the house was shaking. So there it was. After nearly five months in California, I experienced my first earthquake (just one week after seeing my first grass fire). I regret that I didn’t feel the rolling motion in bed, see the blinds moving (since it was dark), or have the presence (and clarity) of mind to know and embrace what was happening, but at least I was here when it happened. Still, learning that it was the biggest Bay Area quake in 25 years and figuring that another shaking of this size is unlikely to occur any time soon, I was disappointed. I felt like a storm chaser who, while observing the tornado, took the wrong road and didn’t get the best possible view. Amazingly enough, there was not a picture out of place nor any other physical evidence of what, evidently, was a most significant shaking. In fact, Rachel’s sister, who was staying with us, said it was the worst quake she’d ever felt. 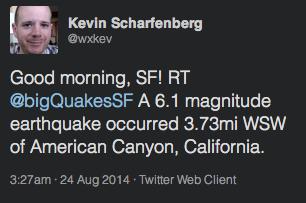 Im sure there will be more earthquakes for you to chronicle.....glad you are all safe on this one. Thanks for the frontline reporting. I know there are some good reseachers who visit this blog as well as those who have a great amount of info at their fingertips, can anyone help with getting me info on our snowfall totals at MSP during el nino seasons.....as some of you know I have a yearly challenge with my brother on the east coast and need some info to make a decision on the handicapping this year as far as inches given,thanks. Good stuff Bill. I enjoy your writing style. I connect with your story! I once experienced an earthquake in Costa Rica that 'nobody else felt'... I was sitting and reviewing some work when the chair gently rocked and a light fixture swayed. Not until I saw a tiny report of seismic activity in the next day's newspaper did I feel vindication because the family thought I was nuts. It was so slight a quake that nobody else paid any attention to it. Leave it to the Minnesotan in me to be freaking out! Thanks for your posts re: the earthquake. They are fascinating to read about during a fairly calm summer here in MN. Thank you! I'm glad you enjoyed the post.